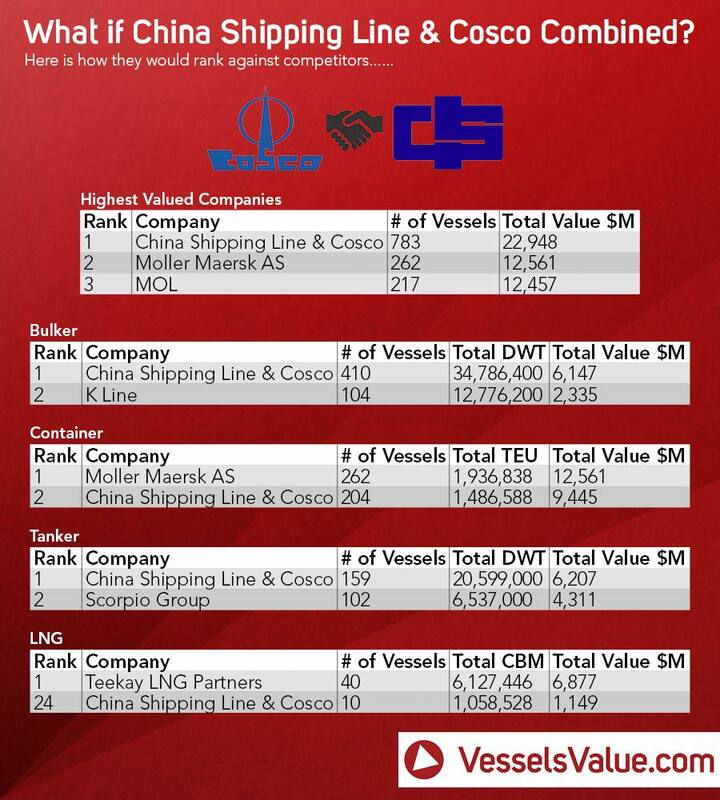 The sheer enormity of the potential merger between China’s top two state-owned shipping conglomerates is revealed today in an exclusive infographic from VesselsValue.com commissioned by Splash. Cosco and China Shipping are now working out how best to proceed with a Beijing-backed merger, likely to be completed by 2017. Were it to go through, the combined entity would become the world’s largest shipping line by quite some distance. With 783 vessels worth $22.95bn, the Chinese giant would be more than $10bn and 500 ships in front of second placed AP Moller Maersk, according to data from VesselsValue.com. It would rank number one in the dry bulk and tanker trades in terms of fleet size and valuation and would be number two in the liner trades. A five-man team is now going through restructuring options with a view to reporting back to Beijing how best to proceed in three months time in what is the greatest shake-up in Chinese shipping in a generation.